Each day, businesses all over the world are turning to the marketing advantages provided by online media, and Fayetteville Flyer is at the forefront of that trend locally. Let us help your company deliver its message to our ever-growing audience. If you’d like to speak with someone immediately regarding your advertising needs, please call Dustin at 479-387-1002 or send us an email. We offer discounts for volume buys. Flyer Sponsors receive ads that update regularly to ensure messages are timely and relevant. We contact you each week to see what you‘d like to promote and then we take it from there. Or you can write your own ads. It’s up to you! 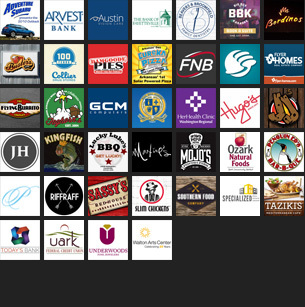 Flyer Sponsors also receive a listing on our Sponsors page, plus recognition in the header and footer of the Flyer. Banner ads are designed to stand out on the site alongside our stories. This helps keep your brand at the top of our readers’ minds 24 hours a day, 7 days a week. Reach our audience on a specific day by publishing a Paid Post on the Flyer which will be featured on our homepage, and then posted to Facebook, Twitter, and Instagram. Some restrictions apply. Paid posts are for businesses to advertise products/services, or for campaign groups to advertise election candidates. General op-ed pieces will not be accepted. Only one sold per day. Character limit subject to approval. Up to 5 free images. Our goal is to work with small- to medium-sized businesses rooted in our community. To acheive this, we’ve developed affordable and effective advertising options for any budget. Several of our long-term packages cost less than $14 per day, including our popular sponsorship program. To get started or for more information, call Dustin at 479-387-1002 or send us an email. Because of the Flyer’s focus on content specifically relevant to Fayetteville, our readers are more local than any other publication in the area. Our daily visitors are educated and engaged in the local community. Best of all, they’re loyal to those businesses who support the Flyer, which they use to stay informed every day. We accept ads in JPG, GIF and PNG file formats; GIF animation and Flash-based ads are accepted, but must be approved individually and may not cycle more than twice. 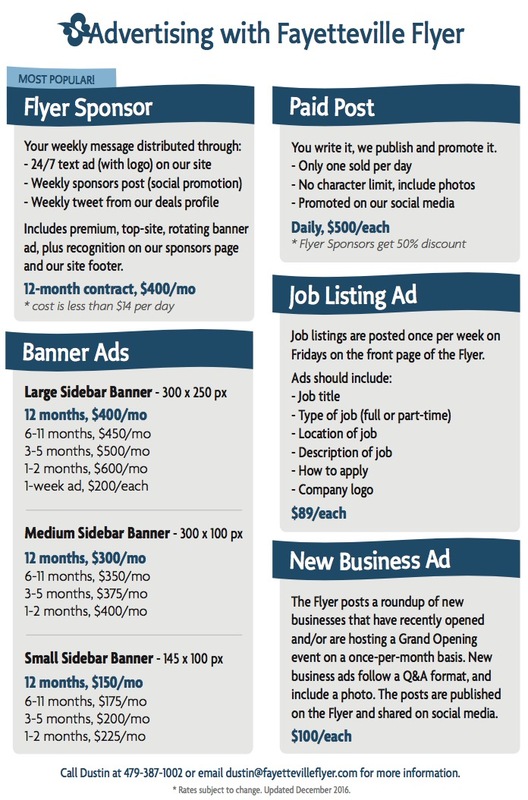 Currently, Fayetteville Flyer accepts ads for businesses and political candidates/groups. Advertisements that appear on Fayetteville Flyer and any other Wonderstate Media sites are paid advertisements. The businesses or candidates being advertised come with no endorsement from Fayetteville Flyer, implied or otherwise. While we reserve the right to reject ads on the basis of taste and appropriateness, we neither accept nor reject ads on the basis of political content. We think this policy is important in helping to preserve the editorial integrity of the news and information we present here on the Fayetteville Flyer. Because we’re in the news and opinion business, ads tied to businesses or candidates can be challenging. If we reject an ad that we disagree with, every ad we accept could be seen as an endorsement. Fayetteville Flyer reserves the right to refuse political ads from anyone or any group for any reason. Fayetteville Flyer reserves the right to include the words “Paid Political Ad” preceding any political ad. All political advertising must be paid for in advance. All ads must list who is paying for the advertisement in a minimum 10 point type at the bottom of the ad. If the ad is not paid for by one specific individual, then the ad must list the official campaign group/committee paying for the ad. Political ads must not reference any opponent (no attack ads). For all ads soliciting political donations for a particular candidate which link to an external site, the landing page must clearly state that the donations are non-tax deductible. Political ads include restrictions on both availability and headline usage. Flyer Sponsor packages are not available for political candidates/groups. Paid Posts for election candidates/groups will not be posted to social media. Headlines for political election ads include strict guidelines, and may be be written by Fayetteville Flyer staff before publishing. Wording will make clear what is specifically being asked of voters, and will be written as such: “Vote for (candidate name/ballot question)” or “Vote against (ballot question).” Fayetteville Flyer will also include the words “Paid Political Ad” preceding any paid political election ad headline. Separate rates may apply to political and election ads. Contact Dustin at 479-387-1002 or send us an email for specific details.